To prevent motion sickness, the first dose should be taken 1/2 to 1 hour before starting activity. 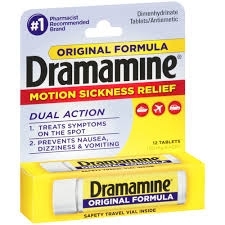 To prevent or treat motion sickness: Adults And children 12 years And over: take 1 to 2 tablets every 4-6 hours; do not take more than 8 tablets in 24 hours, or as directed by a doctor. Children 6 to under 12 years: give 1/2 to 1 tablet every 6-8 hours; do not give more than 3 tablets in 24 hours, or as directed by a doctor. Children 2 to under 6 years: give 1/2 tablet every 6-8 hours; do not give more than 1-1/2 tablets in 24 hours, or as directed by a doctor. Ask a doctor before use if you have A breathing problem such as emphysema or chronic bronchitis, glaucoma, trouble urinating due to an enlarged prostate gland. When using this product Marked drowsiness may occur, avoid alcoholic drinks, alcohol, sedatives, And tranquilizers may increase drowsiness, be careful when driving a motor vehicle or operating machinery. Pregnancy/Breastfeeding: If pregnant of breast-feeding, ask a doctor before use. Keep out of reach of children. In case of accidental overdose, get medical help or contact a Poison Control Center (1-800-222-1222) right away. Colloidal Silicon Dioxide, Croscarmellose Sodium, Lactose, Magnesium Stearate, Microcrystalline Cellulose.